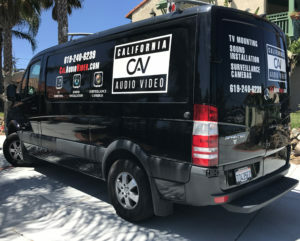 California Audio Video Inc. (CAV) came to the rescue of this San Diego, north county resident. The client had just redone this gorgeous fireplace in slate but failed to consider his entertainment needs until after his fireplace was fully renovated. He called around and many installers were hesitant and reluctant to tackle this project. 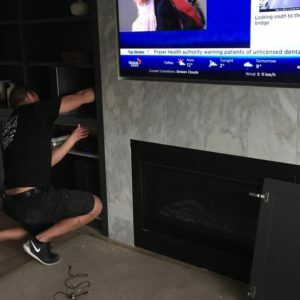 After contacting CAV and receiving a free assessment he made a wise choice and selected CAV to perform the installation, wiring and mounting of his entertainment system. We have the required equipment, specialized tools and experienced technicians to tackle such a project with confidence. Our professionalism, skill and attention to detail put the customer's mind at ease during the whole process. 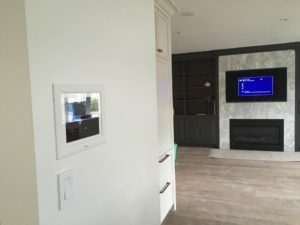 In the endCAV came through and masterfully installed this 65" Samsung QLED TV and integrated it to a Marantz AV receiver, 7 BOSE Virtually Invisible ceiling speakers and recessed iPad to control everything. The customer disliked having 5 remotes to control his previous setup. CAV installed a solution that allowed him to control all aspects of his new setup using any ios or android device. The client selected iPad as his device of choice and CAV took care of the rest.